Holiday Creep: Is Your Ecommerce Stack Up To The Task? Now that the children have returned to school and the 2017 total solar eclipse attracted and awed the citizens of the world, it’s time to think about autumn and winter holidays. They come every year, but so often we’re not ready. Why is that? Mysteriously, Bonfire Night (aka Guy Fawkes) occurs in Great Britain every November fifth. Canadians celebrate Thanksgiving on the second Monday in October. And on the fourth Thursday of November, U.S. Thanksgiving rolls around — whether the turkey thawed fully or not. In other regions, autumn festivals celebrate the power of a goddess (Durga Puja, India) — the victory of light over darkness and good over evil (Diwali, Hindu countries) — and the gathering of family to harvest crops (The Moon Festival, China and other Asian countries). As winter blankets the northern hemisphere in snow, Hanukkah and Christmas celebrations lead up to The Chinese New Year spectacular. Then Mardi Gras unveils springtime and the cycle begins again. With so many annual celebrations… How can we be caught unaware? Is your ecommerce business ready for what may be the all-time busiest online shopping season? What about your website? 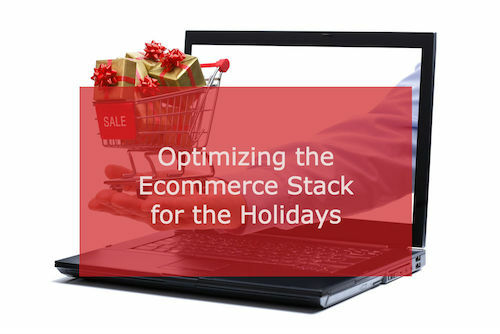 Is your ecommerce stack up to the holiday task? Let’s check it out. What’s an Ecommerce Stack and Why Should You Care? We get that not every ecommerce vendor comfortably deals with technology-speak. But trust us, if you have an ecommerce website, it runs on (or on top of) an ecommerce stack. In computing terms, the “solution stack” or “software stack” describes the technical components which make up and run your website. It may also be referred to as the “platform” on which your website runs. You may be familiar with the platforms chosen most often by small to medium ecommerce retailers: WooCommerce, Magento, and Shopify. Since medium and small ecommerce merchants account for 99% of businesses and 66% of revenues (per Bubba Page, see link above), many high-risk merchants must be choosing those platforms too. The stack incorporates components like an operating system; a web server or middleware; a database; and/or a programming language and off-the-shelf applications. Because different people or companies probably developed components independently, things sometimes go wrong and websites crash. And that’s why you should care. Heading into the major gift-giving season of the year — when retail experts predict dramatic online shopping growth — isn’t the time to hope blindly for the best. Now… that heading creates a delightful visual of Chinese dragons cavorting in parades staged to celebrate The Chinese New Year. But seriously, we talk often about protections like fraud detection software and chargeback management tools… both important ecommerce stack components. As a high-risk ecommerce merchant, your business is ripe for identity theft and fraudulent transactions. Protect your business and your customers with technical solutions like encryption and network firewalls. Solid business processes and well-trained employees also help you detect fraudulent transactions before they occur, perhaps avoiding (on the front end) some chargebacks. Though regardless of safeguards, a proportion of your transactions will be charged back. That’s inevitable, but manageable. So on the back end, incorporate a good chargeback management solution. Your payments provider should be able to help you tame both ends of the fraud-chargeback dragon, and keep it dancing in formation to help ensure your online business success. Purposefully address issues that could crash your site during the holidays. Review your entire ecommerce stack so that you know what to do and who to call if something goes wrong. What role does each stack technology play, and who supports it? Do any ecommerce stack components represent single points of failure (SPOF)? If so, develop remediation plans for each one. Also know who supports which technical components and develop a call register with support names and numbers for all digital solution vendors. If time permits — and you have the bandwidth — consider stress testing your website and any components you’re unsure of. If you’re lucky enough to have a single vendor supporting all aspects of your site, ask them what precautions they’re taking to ensure website stability during the upcoming holiday season. Be sure you and your staff know whom to call if problems arise. Did you identify your payments gateway as a critical component of your ecommerce stack? Be sure you know whom to call if something goes wrong and sales transactions aren’t processing. That’s when the payments processor you chose could turn into the Grinch who puts charcoal into your stocking — or Kris Kringle delivering candy canes and other happy surprises from your wish list. If you’re just starting out and looking for your first payments processor — or you need to find a new one — give yourself a gift. Choose someone who’s expert in the payments industry, who will work with you as a strategic business partner. The first thing he’ll do is to review your business needs and objectives. Only then will he suggest specific payments processing solutions to deliver on both. As far as your ecommerce stack is concerned, he’ll help secure your business and customers’ data with PCI-DSS Level 1 compliant tools (like a robust payments gateway). And he’ll work with you to enable complete fraud prevention and chargeback management tools in your ecommerce stack… To include admin tools and reporting for enhanced business protection. So you’ll hear a lot more than bells jingling this holiday season… because he’ll want you to collect heaps of other things that jingle — like the coin of the realm. Lots and lots of shiny coins.